I want to get away from all the noise and nonsense that’s come to surround St. Patrick’s Day, the once reverent, if myth-filled, holy day turned raucous global celebration. So here’s a reminder of a simpler St. Patrick’s Day, a 1953 letter from a sister in Kerry, Ireland to her brother in Pittsburgh, USA. It’s from a collection of letters I inherited from my aunt a few years ago. 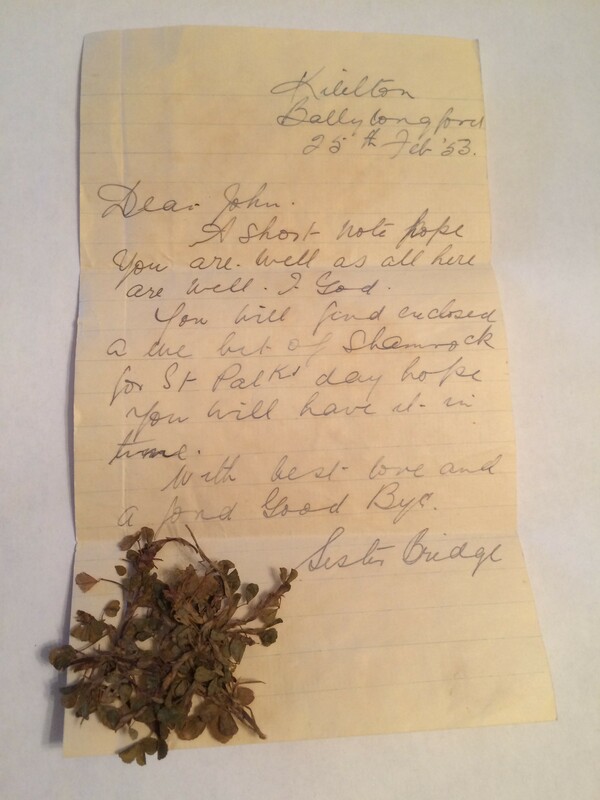 A few other letters from the 1950s also included sprigs of shamrock from the north Kerry countryside. Keep in mind that 1953 was seven years before the election of John F. Kennedy as president (a decade before his return to Ireland and assassination later the same year), and nine years before Chicago began to dye its river green. While the first St. Patrick’s Day parade in Dublin dates to 1931, it was nothing like today’s massive multi-day festivals. This entry was posted in Arts & Culture, History, Irish America, Religion and tagged John F. Kennedy, kerry, St. Patrick on March 14, 2015 by admin.